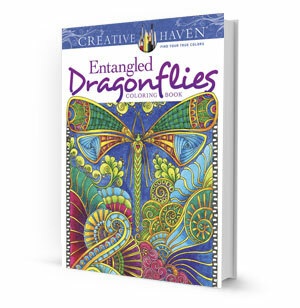 Thirty-one exuberant full-page illustrations to color feature dragonflies in imaginative renditions of natural settings. Inspired by Zentangle, a mode of repetitive patterns, the sweeping designs incorporate a dazzling array of flowers, leaves, and swirling interlocking shapes. Shimmering and graceful, dragonflies add a delicate beauty to the outdoors. Imagine a warm summer day as you choose your colors for this inspired-by-nature collection.